TL;DR: The headphone socket on some Android phones is a good enough signal generator to control servo motors almost directly. I had an idea recently that servo motors could be driven directly from the headphone socket on an Android mobile phone. I was probably subconsciously remembering this old this old Hackaday link; anyway, it turns out that it's very easy to do. Servo motors expect a square pulse of 5V of between 1 and 2 milliseconds, usually once every 20 milliseconds. 1 millisecond is canonically fully left, 2 is fully right, and 1.5ms is in the centre, although there is quite a lot of variation. So, I created a suitable square wave by hand in Audacity, saved it as a .WAV file and played it back on my phone's default media player app, while looking at the headphone levels on an oscilloscope. There are lots of reasons to not expect a square wave to come out of an audio amplifier, but the result was actually a very faithful reproduction of my square wave. The maximum voltage I could get out of it was just under one volt, not enough to drive a servo directly, but enough to turn a transistor on. On both the phones I've tried - a HTC Hero (G2) and Desire C - the voltage out of the headphone port is negative with respect to the value in the wave file, so the wave file needs to be between 0 (off) and -32768 (pulses) for a 16-bit sample. As well as playing back standard audio files, it's pretty easy to generate audio on the fly, so you can control servos direct from your application. Here's my circuit diagram (I've only done shown one channel - it's identical for both). I'm not suggesting you try this - it might break your phone in some way I haven't thought of. This is just to show what I've done. I've used two bog standard NPN transistors in my circuit; the second is acting as a second inverter as the first one inverts the signal once. I think it should be possible to do this with one transistor, and an inverted wave file (using 0 as the pulses and -32768 the remainder of the time) but it hasn't worked when I've tried it and I don't have ready access to an oscilloscope to figure out why. Nonetheless, this is a very cheap way of controlling servos from a mobile phone and I would like to find out whether it works on more Android devices. The transistors cost about £5 for a hundred and there's just another 3 resistors per channel to make it work. It is limited to two servos, so if you want more connectivity, you'll probably be after more powerful devices like the IOIO. This idea gets more useful when you use continuous rotation servos. 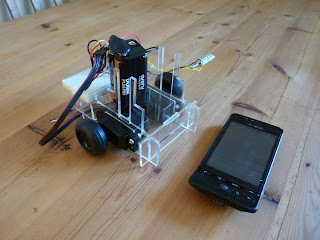 Here's a video of my old phone running two such servos with wheels attached. Even old Android phones have cameras, accelerometers and wifi, which makes them great brains for simple robots. Running two servos from the headphone socket gives them very cheap mobility. PS. I've since become aware of http://www.gluemotor.com/ which is a very similar device. They don't have any transistors; but use a capacitor on each channel to provide AC coupling. I couldn't get this to work when I tried it with my Android phone - maybe with more experimentation. Still, nice work. Here's another couple of PyGame demos. 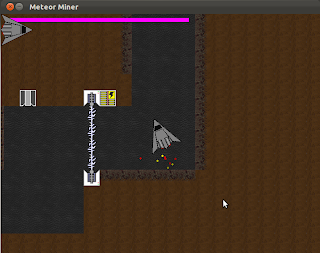 Meteor Miner is a fairly straight clone of an old BBC Micro game, Thrust. Thrust was probably cloned from another platform, but it's not a style of game that has been used much recently. You control a spaceship by turning left or right and accelerating forwards, much like Asteroids, but the goal is to fly inside the structure of a meteor and recover ore. You can also shoot forwards to destroy the guns which will attack you inside the meteor. Fuel is limited and ore makes you heavier. You can escape the meteor with just one tonne of ore, but the goal is to recover all of it. This is the first game I've done with sound, although on all the platforms I've tried (Ubuntu, Windows 7 and Android) the sound suffers from an annoying latency. The game works well with the PyGame subset for Android but as PyGame doesn't handle multi-touch devices yet, I can't emulate the buttons on a touchscreen, so it will only be playable with a keyboard. 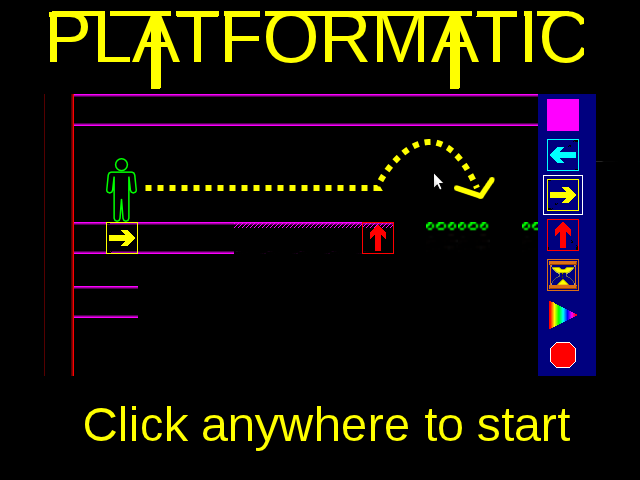 Platformatic is a puzzle game which looks like a platformer; rather than asking the player to time jumps exactly, it asks him or her to place instruction symbols onto the screen, which the character will follow when it treads on them. 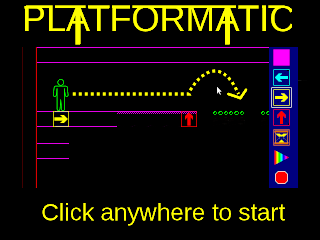 This partly came out of my frustration with platform games which require you to make a long sequence of carefully timed actions, often repeating the first ones hundreds of times until you finally get the last one correct. I'm not particularly pleased with either of these games, but I've forced myself to bring them to a point at which I can publish them, as I otherwise tend to abandon old projects while half-finished and start on new ones. Both games are available from my 2dgames repository on github and are MIT licenced: https://github.com/jmacarthur/2dgames. As before you'll need PyGame to play them; as I get better at creating games, I'll consider packaging some of them up or porting them so they can be played more easily.